If you want to learn German, you have come to the right place. Our website will help you to learn this fascinating language. 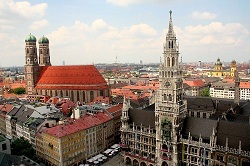 It offers free German lessons, vocabulary, audio recordings, forums and other helpful resources. You might have heard that German language is not easy to master. There are number of reasons why it poses a challenge to language learners. German has complex grammar that includes verb conjugations, three noun genders, four noun cases, and two numbers. For example, the tricky definitive articles "der", "die" and "das" are all gender-specific and change by cases. Despite its reputation of being difficult, German is not impossible to master. The good news is that German pronunciation is fairly simple. You'll find that German words are pronounced exactly as they are spelled. Certain sounds like ö (o umlaut) might cause a share of difficulties to native English speakers but that can be improved with practice. Learn the 30 letters of the German alphabet. This lesson includes phonetic transcription and example words. Discover and learn most popular words in German language. Begin to study more effectively with our German frequency list. In addition, German language belongs to the same language family as English. If you speak English then you already know many German words. Besides that, English and German have many loan words from French, Latin, and Greek—you'll learn to understand even more German vocabulary with minimal effort. According to Modern Language Association, German is the third most studied foreign language in the U.S. after Spanish and French. Next in rank after German are American Sign Language, Italian, Japanese, Chinese, Latin, Russian and Arabic. German is a West Germanic language of Indo-European family. It is spoken as a native language by 90–98 million people in Europe and there are about 80 million non-native German speakers worldwide. If you are studying German to communicate with other German speakers then you are one of around 15 million students who share the same goal as you do. Language Daily is a new kind of language learning site – a place for students to learn foreign languages with free lessons, and for educators to share their knowledge and connect with new audiences. We are building a free resource for everyone to use when learning the German language.